Scott M. Graffius' Agile Scrum: Your Quick Start Guide with Step-by-Step Instructions was named one of the Best Scrum Books of All Time by BookAuthority. A screen shot is available here. 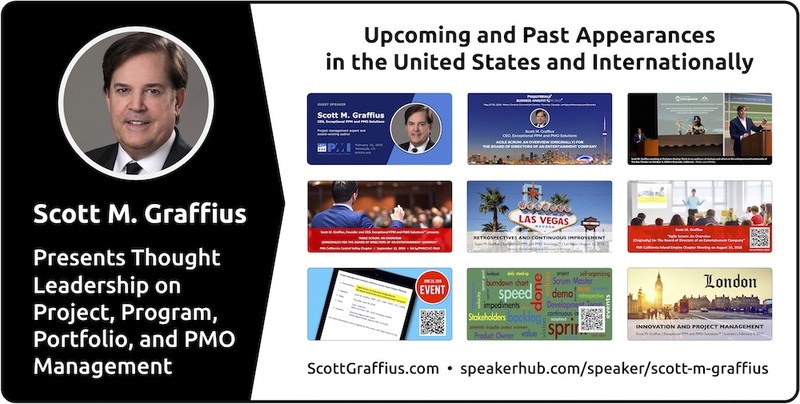 Scott regularly speaks at conferences and other events in the United States and internationally where he delights audiences with presentations on agile, traditional, and hybrid project, program, portfolio, and PMO management. He integrates content on professional standards, best practices, and his first-hand experience with successful implementations. Scott uses everyday language and custom vibrant visuals to make complex topics clear and understandable, and he provides audiences with practical information they can use. Scott spoke at Techstars Startup Week and at events in London and Las Vegas. He also delivered talks at the Los Angeles chapter of the PMI, the California Central Coast chapter of the PMI, the California Inland Empire chapter of the PMI (two events), and the California Central Valley chapter of the PMI. Attendees have said “Scott is an amazing speaker,” “fantastic presentation,” and “highly recommended!” A list of his past and upcoming appearances (including the Project World conference in Canada, and more) is available here. You're invited to review Scott's bio, find out about his speaking engagements, and read articles in the blog. You're also invited to connect with Scott on social. Like his page on Facebook, follow him on Twitter, and connect with him on LinkedIn. The website for his business—Exceptional PPM and PMO Solutions—is http://Exceptional-PMO.com. 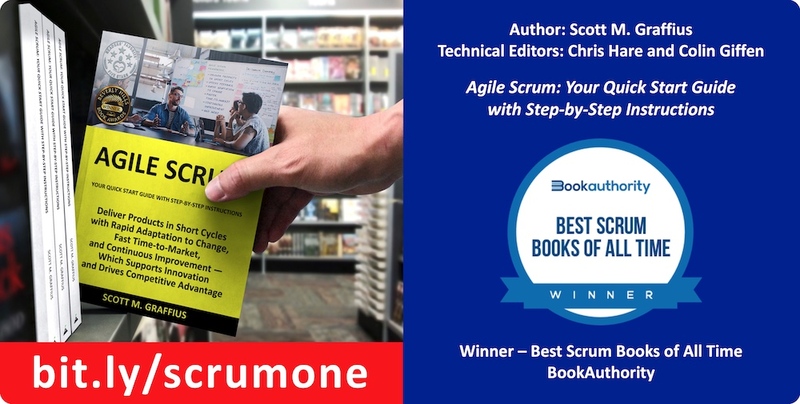 The digital media kit for his award-winning book—Agile Scrum: Your Quick Start Guide with Step-by-Step Instructions—is located at https://AgileScrumGuide.com. 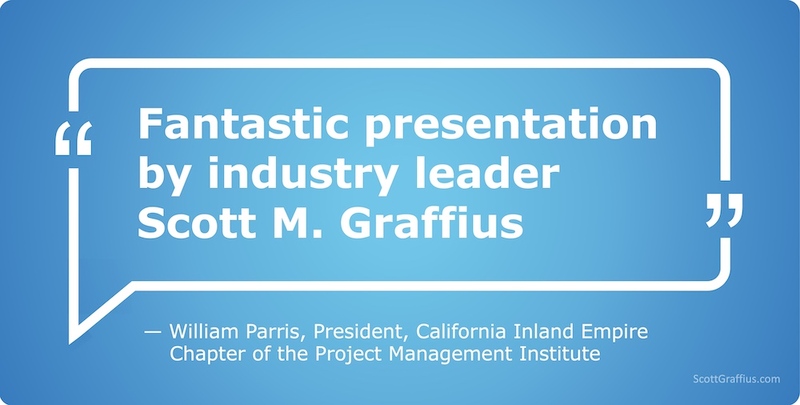 Scott M. Graffius will present "How to Deliver Your Projects with Faster ROI, Competitive Advantage, and Additional Benefits Using Agile Scrum" at the California Inland Empire chapter of the Project Management Institute. The session will provide attendees with a vibrant and highly visual presentation of Scrum, the most popular agile development and delivery framework for products and services. Scott will cover the roles, responsibilities, tools, and techniques unique to Scrum—spanning from vision through release—based on best practices and top factors from successful implementations. Attendees will be presented with practical information they can use. This will be Scott's second talk at the chapter. The session will be held in Murrieta, California on Saturday, February 16, 2019. For more information and to register for the event, visit here. 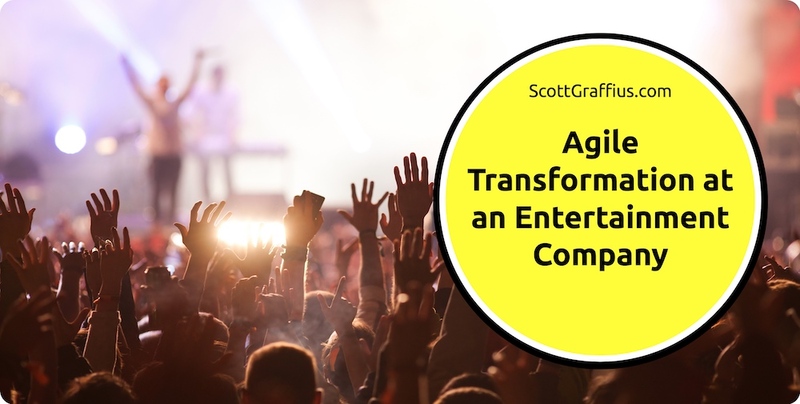 A fantastic agile transformation experience and result with a client in the entertainment industry was the inspiration for Scott’s book, Agile Scrum: Your Quick Start Guide with Step-by-Step Instructions. The publication has garnered 17 first place awards. The credit is shared with Chris Hare and Colin Giffen, the technical editors on the book. Scott and Agile Scrum: Your Quick Start Guide with Step-by-Step Instructions have been featured in Yahoo Finance, the Dallas Business Journal, BookLife by Publisher’s Weekly, Innovation Management, and additional media outlets. A trailer, high-resolution images, reviews, a detailed list of awards and more are available at https://AgileScrumGuide.com. He holds six professional certifications: Certified Scrum Professional (CSP), Certified ScrumMaster (CSM), Certified Scrum Product Owner (CSPO), Project Management Professional (PMP), Lean Six Sigma Green Belt (LSSGB), and IT Service Management Foundation (ITIL). He is a member of the Scrum Alliance, the Project Management Institute, the Institute of Electrical and Electronics Engineers (IEEE), the IEEE Computer Society, the IEEE Consumer Electronics Society, the IEEE Broadcast Technology Society, the IEEE Internet of Things Community, and the IEEE Consultants Network. I had the pleasure of speaking on agile project management at a public event of the Project Management Institute California Inland Empire Chapter (PMICIE) on August 14th. My talk was titled "Agile Scrum: An Overview (Originally) for The Board of Directors of an Entertainment Company." It covered Scrum — including the roles, responsibilities, tools, and techniques unique to the framework — with a focus on best practices and top factors in typical successful implementations. Thank you to William Parris, PMICIE President, and Stacey Wong, PMICIE Vice President of Programs, for the invitation and thank you to everyone who attended the session. I enjoyed meeting and talking with everyone. I'm pleased to present thought leadership on project, program, portfolio, and PMO management related topics of timely importance. I've delivered talks at private and public events in the United States and internationally. Examples of upcoming and past events follow. Scheduled to present “Agile Scrum: An Overview (Originally) for The Board of Directors of an Entertainment Company” at a public event of the Project Management Institute California Inland Empire Chapter (PMICIE) on August 14, 2018. Delivered a talk—“Agile Scrum: An Overview (Originally) for The Board of Directors of an Entertainment Company”—at a public event of the Project Management Institute California Central Coast Chapter (PMI-4C) on June 28, 2018. Spoke on agile project management at a public event of the Project Management Institute Los Angeles Chapter (PMI-LA) on July 25, 2017. Delivered a talk on innovation and project management at a private event in London, England on February 9, 2017. I'm now on SpeakerHub. My profile includes information on availability, fees, pro bono work, and more. 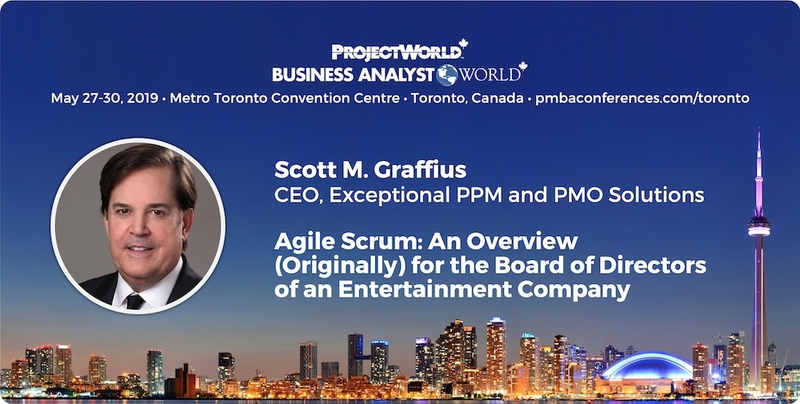 Scott M. Graffius, CEO of Exceptional PPM and PMO Solutions and author of Agile Scrum: Your Quick Start Guide with Step-by-Step Instructions, will be speaking at Project World * Business Analyst World Toronto 2019. He will be presenting best practices on agile project management, including tools and techniques which attendees will be able to immediately apply at work. His talk will be held on Tuesday, May 28, 2019 at the Metro Toronto Convention Centre in Toronto, Canada. You can read more about it here: http://bit.ly/AGILE-1. Scott is the CEO of Exceptional PPM and PMO Solutions, a professional services firm, where he partners with client companies to help them achieve their strategic objectives and business initiatives through project management leadership. The consultancy provides project, program, portfolio, and PMO management services inclusive of agile, traditional, and hybrid development and delivery frameworks. Business results include improved responsiveness to business needs, faster delivery and time-to-market, upgraded on-budget performance, higher customer and stakeholder satisfaction, and greater competitive advantage. For additional information including infographics and more, visit http://Exceptional-PMO.com. The conference—which appears stylized as ProjectWorld*BusinessAnalystWorld—is an educational and training event for project management and business analysis professionals. Thought leaders will arm attendees with new skills, tools, and techniques that can be immediately applied in the workplace. Over 30 expert speakers will present more than 40 interactive sessions, workshops, and keynotes. All sessions are Project Management Institute (PMI) and International Institute of Business Analysis (IIBA) accredited. Offering professional development units (PDUs) and continuing development units (CDUs) for each hour of learning, attendees can earn up to 26 credits over the four-day period. It will be held on May 27-30, 2019 at the Metro Toronto Convention Centre in Toronto, Canada. The official hashtag is #PWBAWTOR19. The website for the conference is here: https://www.pmbaconferences.com/toronto. Scott M. Graffius presents thought leadership on project, program, portfolio, and PMO management related topics of timely importance. He regularly speaks at private and public events in the United States and internationally. This article provides an overview of his prior speaking engagements. The most recent event is shown first. Scott spoke at Techstars Startup Week, where he presented "Agile Scrum Helps Innovators, Disruptors, and Entrepreneurs Develop and Deliver Products at Astounding Speed Which Drives Competitive Advantage" to an audience of startups and others in the entrepreneurial community on October 4, 2018. Scott presented “Agile Scrum: An Overview (Originally) for The Board of Directors of an Entertainment Company” at a meeting of the PMI California Central Valley Chapter (PMI-CCVC) on September 13, 2018. Scott facilitated an interactive workshop, “Retrospectives and Continuous Improvement in the Agile Scrum Framework,” at a private event in Las Vegas, Nevada on August 25, 2018. Scott presented “Agile Scrum: An Overview (Originally) for The Board of Directors of an Entertainment Company” at a meeting of the PMI California Inland Empire Chapter (PMICIE) on August 14, 2018. 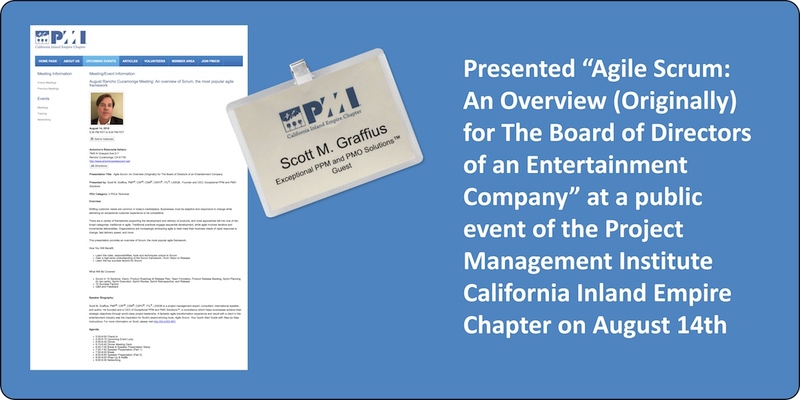 Scott presented “Agile Scrum: An Overview (Originally) for The Board of Directors of an Entertainment Company” at a meeting of the PMI California Central Coast Chapter (PMI-4C) on June 28, 2018. He was a guest speaker on agile project management at an event of the Project Management Institute Los Angeles Chapter (PMI-LA) on July 25, 2017. Scott gave an interactive talk on innovation and project management at a private meeting in London, England on February 9, 2017. 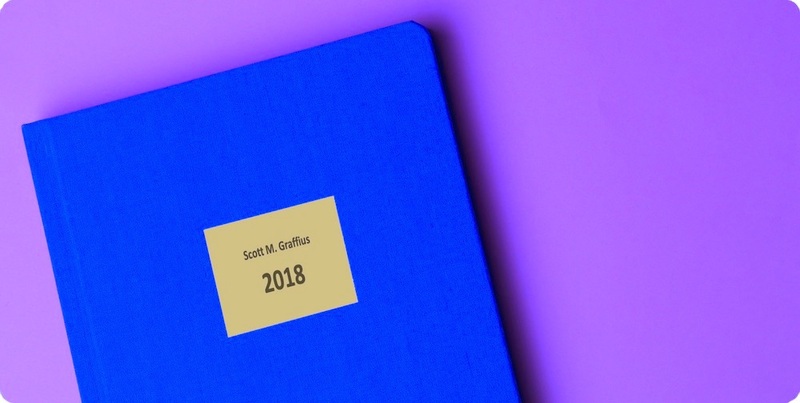 For more information on Scott’s speaking engagements including a list of prior and upcoming engagements, visit http://scottgraffius.com/publicspeaker.html. 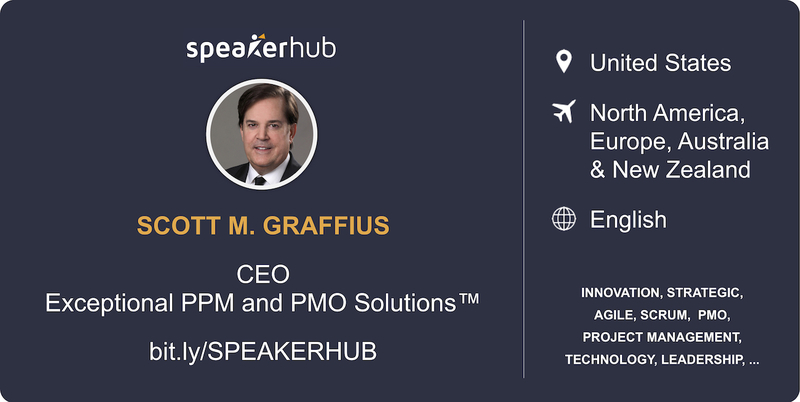 Scott M. Graffius, CSP, CSM, CSPO, PMP, ITIL, LSSGB is a project management expert, consultant, international speaker, and award-winning author. He is the CEO of Exceptional PPM and PMO Solutions, a professional services firm, where he partners with client companies to achieve their strategic objectives and business initiatives through project management leadership. The consultancy provides project, program, portfolio, and PMO management services inclusive of agile, traditional, and hybrid development and delivery frameworks. Business results include upgraded responsiveness to business needs, faster delivery and time-to-market, improved on-budget performance, higher customer and stakeholder satisfaction, and greater competitive advantage. Scott is a former vice president of project management with a publicly traded provider of diverse consumer products and services over the Internet. Before that, he ran and supervised the delivery of projects and programs in public and private organizations with businesses ranging from e-commerce to advanced technology products and services, retail, manufacturing, entertainment, and more. He has experience with consumer, business, reseller, government, and international markets. Additional information is available at: http://Exceptional-PMO.com/who_we_are/bio. 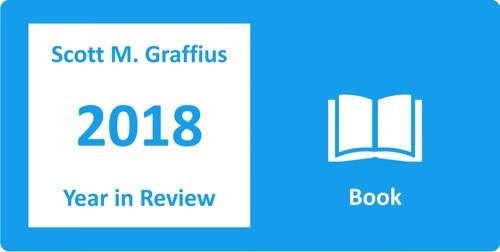 A fantastic agile transformation experience and result with a client in the entertainment industry was the inspiration for Graffius's book, Agile Scrum: Your Quick Start Guide with Step-by-Step Instructions. It helps technical and non-technical teams develop and deliver products in short cycles with rapid adaptation to change, fast time-to-market, and continuous improvement -- which supports innovation while driving competitive advantage. The book has garnered 17 first place awards. A trailer, high-resolution images, reviews, a detailed list of awards and more are available at: https://AgileScrumGuide.com. Exceptional PPM and PMO Solutions (http://Exceptional-PMO.com) helps organizations achieve their strategic objectives and business initiatives via world-class project management. The firm provides expert advisory, training, and facilitative consulting services related to project, program, portfolio, and PMO management in agile, traditional, and hybrid development and delivery frameworks. 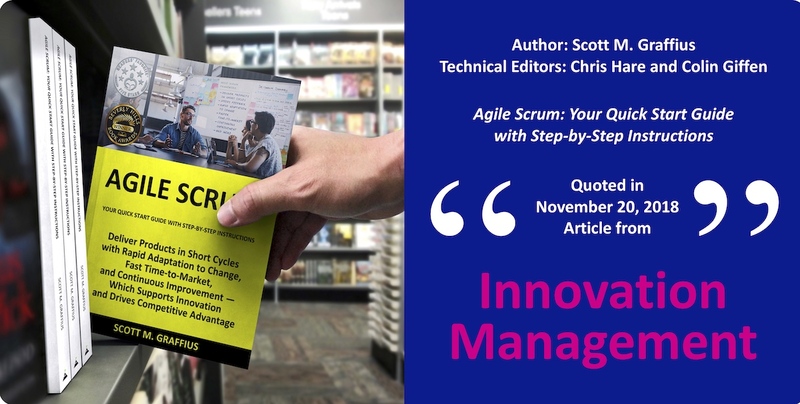 Agile Scrum: Your Quick Start Guide with Step-by-Step Instructions (Scott M. Graffius, author; Chris Hare and Colin Giffen, technical editors) was quoted by Julia Myllylä in her article which appears in Innovation Management. This Swedish-based publication has the mission to provide relevant, inspiring and actionable knowledge to businesses and individuals looking to increase their innovation capabilities. The quote from Agile Scrum—“If you don’t collect any metrics, you’re flying blind. If you collect and focus on too many, they may be obstructing your field of view.”—is located at point 5 of the article. 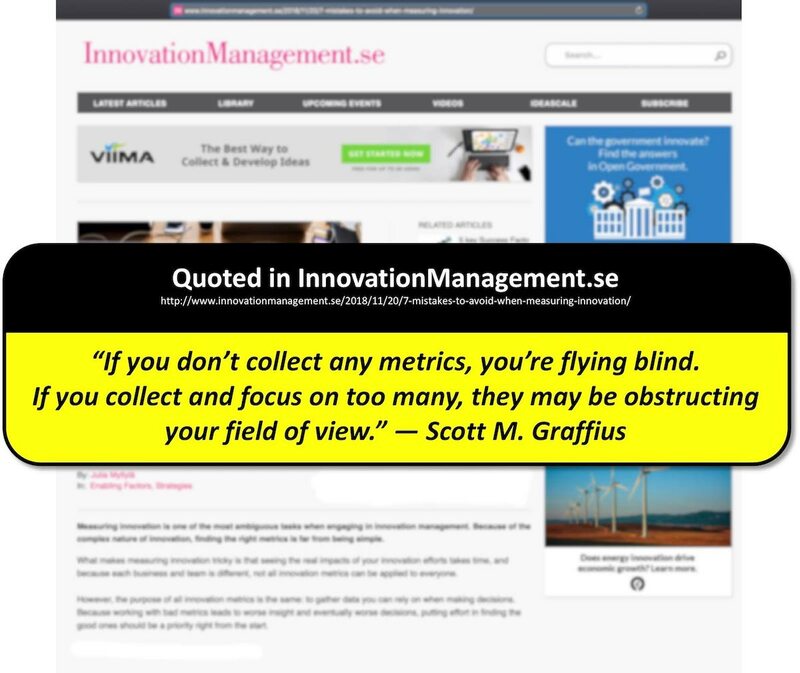 It was published on November 20, 2018, and you can read it here: http://www.innovationmanagement.se/2018/11/20/7-mistakes-to-avoid-when-measuring-innovation/. Agile Scrum: Your Quick Start Guide with Step-by-Step Instructions helps technical and non-technical teams develop and deliver products at astounding speed with rapid adaptation to change and continuous improvement—which supports innovation and drives competitive advantage. The book has garnered 17 first place awards. Scott and his publication have been featured in Yahoo Finance, the Boston Herald, NBC WRAL, the Dallas Business Journal, the PM World Journal, BookLife by Publisher’s Weekly, and additional media outlets. Content from Agile Scrum: Your Quick Start Guide with Step-by-Step Instructions (Scott M. Graffius, author; Chris Hare and Colin Giffen, technical editors) is quoted in a piece by Informa Middle East. Informa is a leading Dubai-based company offering business intelligence, academic publishing, and services in event management. A red arrow in the accompanying image (a higher resolution version is available here) points out the quote. 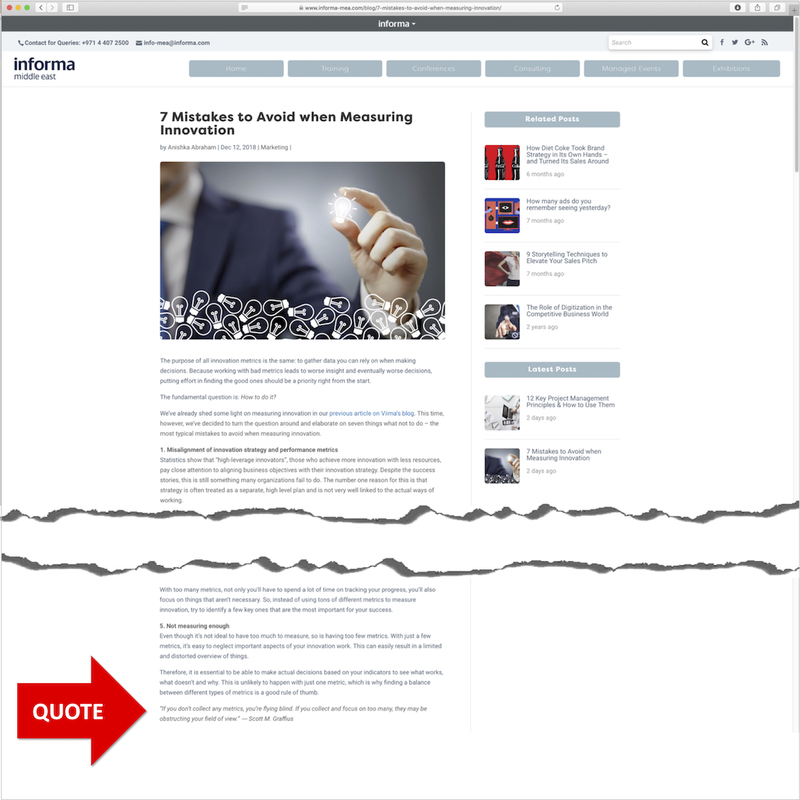 You can read the Informa article by Anishka Abraham—which includes what to do and avoid with metrics—here: https://www.informa-mea.com/blog/7-mistakes-to-avoid-when-measuring-innovation/. Scott M. Graffius, CSP, CSM, CSPO, PMP, ITIL, LSSGB is a project management expert, consultant, international speaker, and award-winning author. He is the CEO of Exceptional PPM and PMO Solutions, a professional services firm, where he partners with client companies to help them achieve their strategic objectives and business initiatives through project management leadership. The consultancy provides project, program, portfolio, and PMO management services inclusive of agile, traditional, and hybrid development and delivery frameworks. Business results include upgraded responsiveness to business needs, faster delivery and time-to-market, improved on-budget performance, higher customer and stakeholder satisfaction, and greater competitive advantage. Scott is a former vice president of project management with a publicly traded provider of diverse consumer products and services over the Internet. Before that, he ran and supervised the delivery of projects and programs in public and private organizations with businesses ranging from e-commerce to advanced technology products and services, retail, manufacturing, entertainment, and more. He has experience with consumer, business, reseller, government, and international markets. Additional information is available at: http://Exceptional-PMO.com/who_we_are/bio. Agile Scrum: Your Quick Start Guide with Step-by-Step Instructions helps technical and non-technical teams develop and deliver products at astounding speed with rapid adaptation to change and continuous improvement—which supports innovation and drives competitive advantage. The book has garnered 17 first place awards. Scott and his publication have been featured in Yahoo Finance, the Boston Herald, NBC WRAL, the Dallas Business Journal, the PM World Journal, BookLife by Publisher’s Weekly, Innovation Management, and additional media outlets. 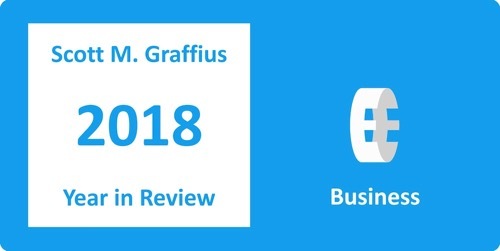 I’ve compiled a review of 2018. This post highlights my consulting business, book, speaking appearances, and blog. Organizations need to realize their strategic objectives and business initiatives. My professional services firm, Exceptional PPM and PMO Solutions™, helps our clients achieve those needs through advisory, training, and facilitative consulting services related to project, program, portfolio, and PMO management. Our expertise spans agile, traditional waterfall, and hybrid development and delivery frameworks. To learn more about the company, please visit http://exceptional-pmo.com. A book and speaking appearances—extensions of Exceptional PPM and PMO Solutions™—are highlighted individually below. Inspired by a fantastic agile transformation experience and result with a client in the entertainment industry, Agile Scrum: Your Quick Start Guide with Step-by-Step Instructions was published in 2016. It helps technical and non-technical teams develop and deliver products in short cycles with rapid adaptation to change, fast time-to-market, and continuous improvement—which supports innovation and drives competitive advantage. Between the date of publication and 2017, it garnered 15 first place awards from national and international competitions. The credit is shared with Chris Hare and Colin Giffen, the technical editors on the book. Attention and interest continued in 2018. Accolades included two additional first place awards (making the updated total 17), being featured as a success story by the BEA, and more. And Agile Scrum: Your Quick Start Guide with Step-by-Step Instructions and I were featured in Yahoo Finance, Innovation Management, Informa Middle East, and additional media publications. Bookstores and Online Retailers - available to online and offline retailers such as Barnes & Noble and to distributors such as Ingram and the National Association of College Stores, Inc. (NACSCORP). Libraries and Academic Institutions - offered through Baker & Taylor to libraries and academic institutions. CreateSpace Direct - available to certified resellers through the CreateSpace Direct wholesale website. Agile Scrum is still offered in print and digital formats at Amazon. The paperback is available in Canada, France, Germany, Italy, Spain, the United Kingdom, and the United States. The ebook is for sale in Australia, Brazil, Canada, France, Germany, India, Italy, Japan, Mexico, the Netherlands, Spain, the United Kingdom, and the United States. A trailer, high-resolution images, reviews, a detailed list of awards, and more on Agile Scrum are available in the digital media kit at https://AgileScrumGuide.com. Upcoming appearances in 2019 include the Project World conference in Canada, another talk at a PMI chapter, and more—to be announced. You can read more about my speaking engagements at http://bit.ly/SpeakerOne. 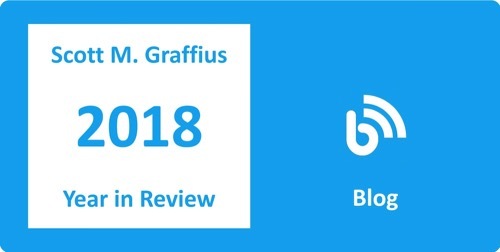 My blog at http://scottgraffius.com/blog provides news, tips, and more on the intersection of project management with business and technology. In 2018, I published 48 new articles on the site. That’s down from last year, when I produced 65. However, traffic has been steadily growing per data from Google Analytics. In 2018, the blog had 109,771 page views, compared with 57,139 the prior year. That’s an increase of 92%! Are Agile and Scrum Limited to Technology Projects or Technology Industries? The majority of visitors (53%) came from the United States. Rounding out the top 10 were France, the United Kingdom, Germany, Canada, Philippines, Brazil, India, Australia, and Sweden. While not in the top 10 for the year, there was a significant increase in traffic (primarily in late 2018) from Belgium, the Netherlands, and Japan. Thank you for visiting the blog! 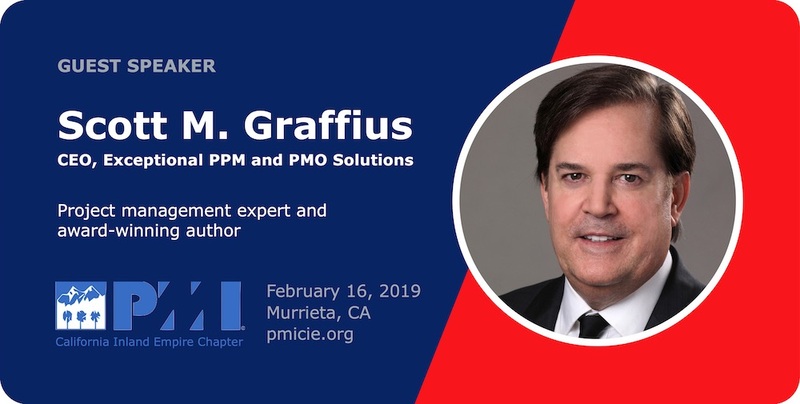 I had the honor and pleasure of speaking to a highly-engaged audience at an event of the California Inland Empire chapter of the Project Management Institute (PMICIE) on February 16, 2019. My presentation was titled "How to Deliver Your Projects with Faster ROI, Competitive Advantage, and Additional Benefits Using Agile Scrum." Thank you to everyone who attended the event. Special thanks to Stacey Wong, Vice President of Programs for the PMICIE, and William Parris, President of the PMICIE, for inviting me back. This was my second talk at the chapter. For more information on the PMICIE, please visit their website at https://pmicie.org. Agile Transformation at an Entertainment Company: Based on a True Story continues with Part Two: The Goals. 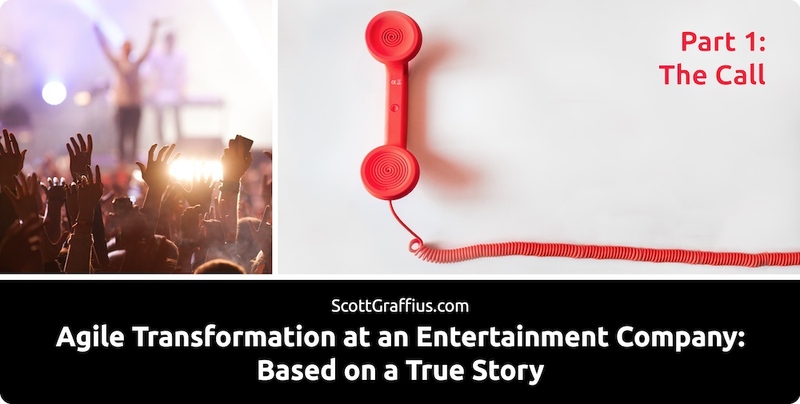 A fantastic agile transformation experience and result with a client organization in the entertainment industry was the inspiration for Scott M. Graffius’ book, Agile Scrum: Your Quick Start Guide with Step-by-Step Instructions. It helps technical and non-technical teams develop and deliver products in short cycles with rapid adaptation to change, fast time-to-market, and continuous improvement—which supports innovation and drives competitive advantage. The book has garnered 17 first place awards from national and international competitions. Credit is shared with Chris Hare and Colin Giffen, the technical editors on the publication. Scott and Agile Scrum: Your Quick Start Guide with Step-by-Step Instructions have been featured in Yahoo Finance, the Boston Herald, NBC WRAL, the Dallas Business Journal, the PM World Journal, Learning Solutions, Innovation Management, and additional media publications. A trailer, high-resolution images, reviews, a detailed list of awards, and more are in the digital media kit at https://AgileScrumGuide.com. The book is available at Amazon, Barnes & Noble, Strand Books, Harvard Book Store, Books-a-Million, The Booksmith, Hudson Booksellers, Savoy Bookshop & Café, Compass Books at SFO/Books Inc., Books & Books - Miami, University Press Books – Berkeley, and other retailers, distributors, and partners. You're invited to review Scott's bio, find out about his speaking engagements, and read additional articles in the blog. The website for his business—Exceptional PPM and PMO Solutions™—is http://Exceptional-PMO.com. 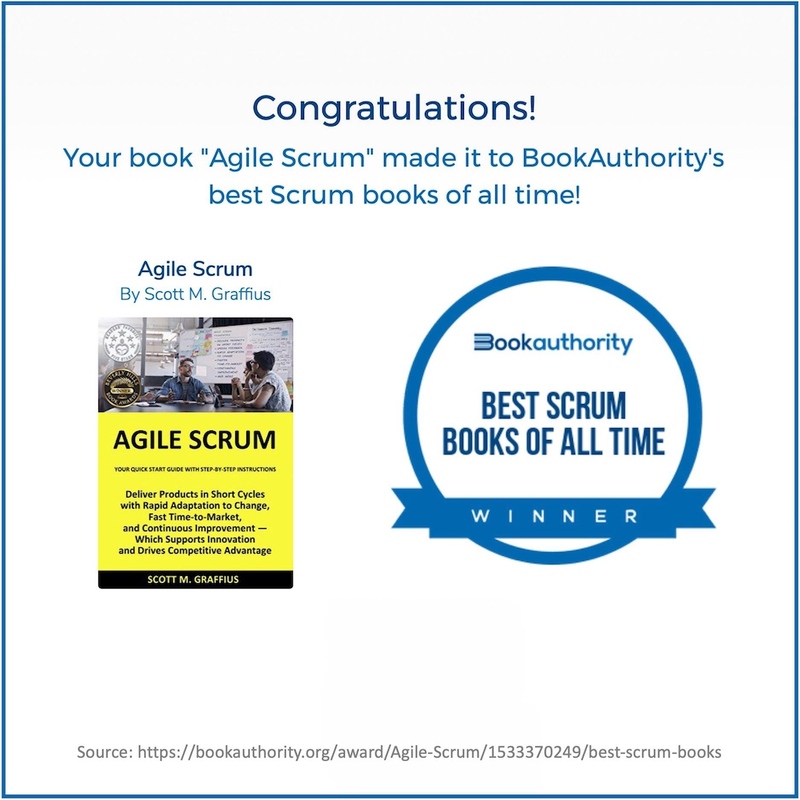 The digital media kit for his award-winning book—Agile Scrum: Your Quick Start Guide with Step-by-Step Instructions—is located at https://AgileScrumGuide.com. 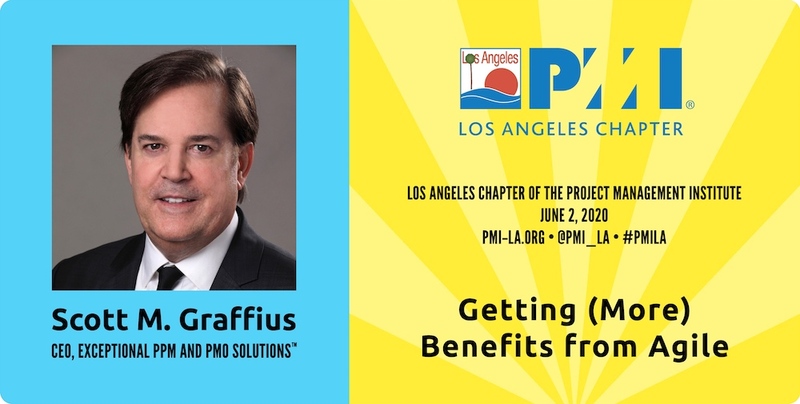 Scott M. Graffius will present "Getting (More) Benefits from Agile" at the Los Angeles chapter of the Project Management Institute. He will deliver practical information including top factors from successful Scrum implementations—based on his first-hand experience and 116 sources—which attendees can leverage to gain (more) benefits from agile. This will be Scott's second talk at the chapter. The session will be held in Santa Clarita, California on June 2, 2020. In early 2020, additional information including the time and venue for the talk will be shown at http://scottgraffius.com/publicspeaker.html. Do You Know the Lifespan of Your Posts on Social Media? How Long Do Your Social Media Posts Last? How Long Does Content Last? What is the Lifespan of a Facebook Post? What is the Lifespan of a LinkedIn Post? What is the Lifespan of a Pinterest Post? What is the Lifespan of a Tweet? What is the Lifespan of Social Media Posts? Copyright © 2019 Scott M. Graffius. All rights reserved. Site Map.